The Air Training Corps is a uniformed youth organisation parented by the Royal Air Force which aims to promote and interest in aviation and the Royal Air Force, to provide training which is useful in both civilian and military life, to foster the spirit of adventure and to develop the qualities of leadership. 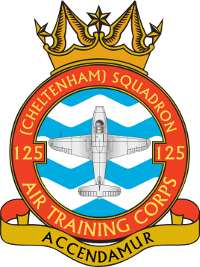 125 (Cheltenham) Squadron is based in Charlton Kings. As a Squadron we pride ourselves on high standards, an inclusive atmosphere and on bringing the best out of our cadets. We are always on the lookout for new recruits.